Test Pit Towers is no stranger to the Roku, the set-top box you plug into your TV to stream services such as Netflix, Now TV, and BBC iPlayer, and in fact this review will be of the fourth device from them that we've tested. We don't mean to jump the gun here, but we've clearly saved the best for last. We review the Roku 3. Excuse the hyperlinks here guys, but previously we have tested the Roku 2 XS, the Roku 2, and the Roku Streaming Stick. All devices have impressed us with their ease of use, choice of channels and services, and additional features that might not be offered by competitors (cough, Apple, cough!). For the past couple of years our gaff has been The House of Roku, and whenever we've all kicked back to stream some Netflix shows or YouTube videos it has been thanks to one of those gadgets. 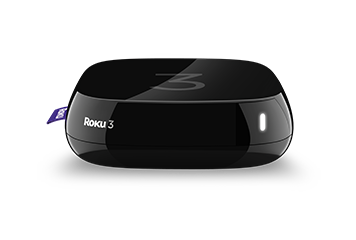 However, clearly we've been missing a trick, as they all now pale in comparison to the big boy, the older brother, the flagship device... Roku 3. In a nutshell, you plug this into your telly and it essentially turns it smart. You can connect to the internet to stream shows from different providers (many are free such as those offered by the BBC, Channel 4, and YouTube, while offers require a subscription such as Netflix and Now TV) bringing what you might have only watched on your computer, tablet or phone to the big screen of you living room... and much more. 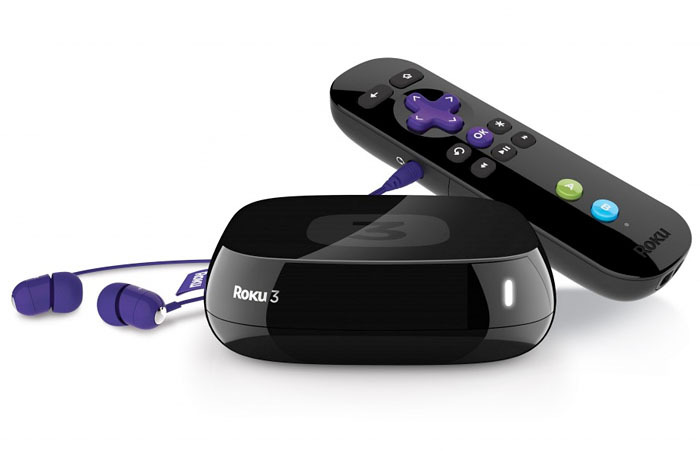 Physically the Roku 3 looks very much like the Roku 2 with those rounded edges and dark plastic. 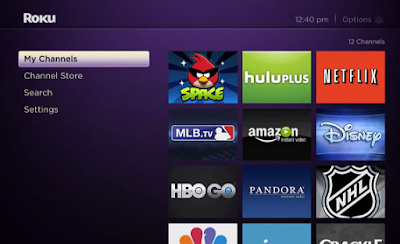 The remote is also very similar with the distinctive Roku purple keys and buttons. However, underneath all that the 3 is far more powerful and faster, while coming stacked with extra features that really enhanced our viewing. The unit can play 1080p HD content, includes a far faster processor, and features both a USB and Micro SD card port to play saved media in MP4 and MKV formats. And games! The remote can be turned on its side and used like a gamer controller, NES-style. There are A and B buttons on one side to allow you to play games which are available, just like channels, in the main menu. The great thing here is that as well as working like a conventional video game controller, the remote is packed with motion sensors so it can act in a similar way to a Wii controller. 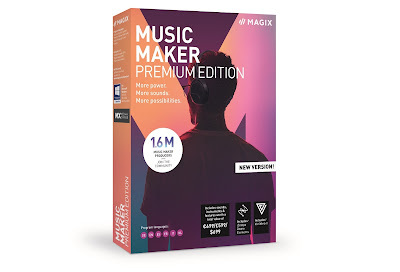 Even if you have no interest in gaming, and might buy one of these purely for films and TV, it is great to have this available for kids; especially those who might be too young to play console games. Sticking with the remote, on the side you'll find a headphone port to plug in the included pair from the box. Doing so allows one person to watch the Roku without disturbing other people in the room, acting like wireless headphones. This actually works very well, and we were pleased to see that there is no lag and loss of lip sync while doing so. The remote conveniently doesn't require line of sight with either your TV or the Roku 3, and can even be used from quite a great distance, and through walls. Still, if this is your first Roku, we guarantee it will take you about three months to get out of the habit of pointing the remote at the screen. If you think that all sounds just a bit too futuristic, your mind will be blown by the ability to search for stuff using your voice. Yes, you are living aboard the starship Enterprise, and no you don't have to get felt up by William Shatner. Voice search is unique to the Roku 3 and extremely handy for finding things across all the various channels and services you're subscribed to. Can't find something in Netflix? Just speak the title and the Roku will find it for you. And it will do all of that extremely quickly. We've never had any complaints about the speed at which Roku players perform, but the Roku 3 works at hyperspeed. Obviously the rate at which you can stream content from the internet depends entirely on your broadband speed, but even clicking through the menu screen and loading content is acheived very fast and reassuringly smooth. The Roku 3's dual-band Wifi is made for making the most out of your internet connection, and in the couple of weeks that we have been testing it, there has never once been an issue with lag or buffering mid show. Everything just happens, as it should, every time. 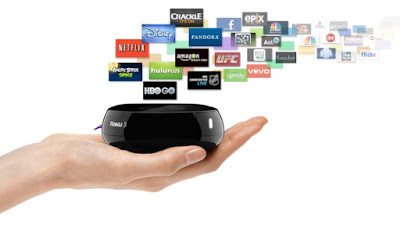 Big fans of Roku, we're super glad to have now reviewed every member of the (current) gadget family. Although twice as much as the Roku Streaming Stick, those extra pennies are buying you a lot more. Even without the added benefits of the games, the voice search, and the USB/SD ports, the Roku 3's faster more reliable performance shifts it straight to the top of our living room entertainment list.